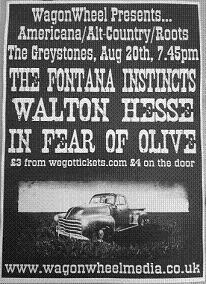 On Saturday August 20th, WagonWheel Presents… brings another great triple bill to The Greystones. We welcome back Walton Hesse who played two fantastic shows at The Grapes last year, we have a solo set from Tom Campbell of The Fontana Instincts, and we’re also joined by Doncaster band In Fear Of Olive who look set for great things. Advance tickets priced at £3 are available from WeGotTickets.com (http://www.wegottickets.com/event/123420) or entry will be £4 on the night. Doors open 7.45pm for an 8pm start. In Fear Of Olive may be from Yorkshire, but they have a distinct American rootsy vibe that permeates their not so traditional folk style. They have recently been picking up lots of BBC Radio play and are set to appear at several festivals throughout the summer as they support the recent release of their EP ‘All We Can Do Is Wonder’, recorded with renowned folk/roots producer Keith Angel. Burst into being from the sunny imagination of songwriter Matt Grayson, Walton Hesse are a lapsed congregation of optimistic outcasts standing on the shoulders of Big Star and Wilco, peering into the shaft of a 13th Floor Elevator. Frontier facing and burdened by a twisted nostalgia this alt-country psych creation blend the melodious harmonies of Matt and Nicola Crosby, haunted by the ghostly union of Gram and Emmylou to bring Arizona desert plains to the streets of Manchester. The dual status of banjo playing lead guitarist Dom Marsh creates a butterfly of sound to intertwine a flawless rhythm section of Dan Fleming on drums, Scott Carey on bass and Dor Knightley on keys. Walton Hesse have been friends forever, born of a chance encounter and a ten year love affair the North Mancunian scum scrub up golden in the sunshine, blend MC5, Creedance and Hank Williams to shake the peaches from your dusty tree. Walton Hesse make you homesick for a place you’ve never lived… so don’t look now, listen, and bring it home. The Fontana Instincts evolved around Derby singer/songwriter Tom Campbell, becoming a full band that blends alternative, americana, indie, rock, psychodelic, folk, blues and country influences. Their unique and varied style has been winning them many fans. They’ve been working hard over recent months on recording their debut album, which they hope to release later this summer. Tonight Tom plays solo.